Youngsters trust the stars of social media more than their parents, according to new research that reveals how digital habits are sidelining family and friends. Experts found that 18- to 35-year-olds – the millennial generation – are twice as likely to trust internet ‘influencers’ as a close relative or companion. 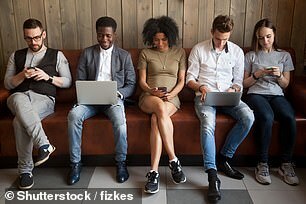 Dubbing them ‘gullennials’ – for gullible millennials – researchers found 53 per cent believe advice on Facebook, Instagram and from online bloggers is more reliable than from family and friends when booking a holiday. Critics, however, warn that online advice is not always unbiased or trustworthy. Companies are increasingly sponsoring posts by celebrities who can subtly use their influence among their millions of followers to increase sales. As a result, social-media influencers can earn vast sums by promoting lifestyle products and holiday destinations to huge fanbases. The digital agency 383 surveyed 2,032 UK adults on the trustworthiness of internet recommendations. Spokesman Sukhi Dehal said: ‘It’s a huge concern that the younger generation is so trusting of a source that may or may not be telling the whole truth.